This help note will guide you through the process of moving Calxa from your current computer to a new computer. Also covered in this help note are steps to help you reconnect to your existing Calxa database. Ensuring you are able to locate your Calxa database so you will be able to reconnect to it when you install Calxa on the new computer should be your first step. Browse to this location using Windows Explorer and copy your Calxa database to your new computer. In the example above this is the file named Default.CalxaDB and you can see it is saved in a Calxa folder inside the Documents folder. If you use an SQL Server data source you will see your data source noted as below. You will not need to copy your data to the new machine however you should take note of the connection properties, including the SqlServer name and Database name. Depending on your exact license and the number of machines you currently have Calxa installed on it may be necessary to deactivate the old machine license in order to activate on the new machine. If you intend on having Calxa active on both machines then skip this entire step. The Activation ID is a unique identifier that is created when you first activate Calxa on your computer. This allows Calxa to identify how many computers currently have actived with your serial number and is required to deactivate a machine. 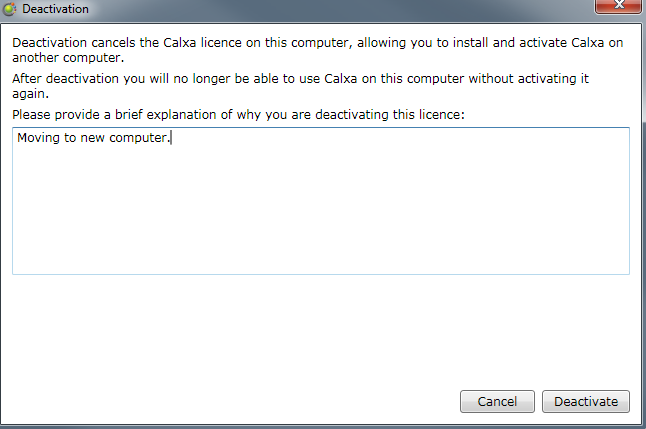 Type in a brief explanation for deactivating the licence on the computer and then click on the Deactivate button. You will then be prompted as to whether you are sure you want to deactivate the licence on your computer. If you are satisfied with continuing, click on the Yes button. After deactivating Calxa on your computer Calxa will automatically close itself. You have now successfully deactivated the licence on your computer and are now free to activate it on a new computer. Follow the instructions in our support note – Installing Calxa – to install and activate Calxa on your new computer. When running Calxa for the first time you will be welcomed with the Open or Create Calxa database screen. If you have copied over a local database from your old machine, you should select Local database and then click on the Create/Open button and browse to the location of your existing database. If you are using an SQL Server database you will select Network database and enter the Server name and Database name before clicking Sign In.